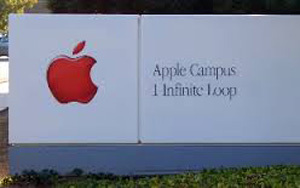 Blacks, Hispanics Underrepresented at Apple Inc. 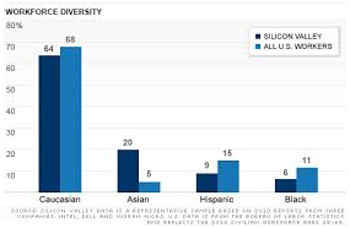 Blacks, Hispanics are underrepresented in Apple's workforce, which primarily relies on white and Asian men for its top-paying technology jobs, feeding the perception that Silicon Valley's economic boom is largely excluding blacks, Hispanics, and women. A breakdown released Tuesday by Apple Inc. showed 54 percent of the company's technology jobs in the U.S. are filled by whites and another 23 percent by Asians. Men make up 80 percent of Apple's technology workforce throughout the world. The iPhone and iPad maker didn't provide racial statistics for its global workforce of 98,000 employees. Apple's technological tilt toward white and Asian men is similar to situations previously disclosed during the past three months by other major Silicon Valley companies, including Google Inc., Yahoo Inc., Facebook Inc., Twitter Inc. and LinkedIn Corp.
Apple, the world's most valuable company, has the largest workforce among that group. A significant chunk of Apple's $575 billion market value has enriched Apple programmers and other technology workers who received stock options to supplement their salaries, which routinely exceed $100,000. The tech companies have been sharing the demographic data that they compile for the U.S. Equal Employment Opportunity Commission under pressure from the Rev. Jesse Jackson and his Rainbow PUSH coalition. Jackson has been focusing on the tech companies because the industry has become a catalyst for new jobs and wealth as consumers buy more gadgets and spend more time immersed in digital services. Like its peers, Apple acknowledged its workforce isn't as diverse as it should be. Apple CEO Tim Cook expressed his disappointment in a letter posted alongside the company's data. Lower-level executives of the other tech companies had addressed diversity when they disclosed the compositions of their workforces. "Let me say up front: As CEO, I'm not satisfied with the numbers on this page," Cook wrote. "They're not new to us, and we've been working hard for quite some time to improve them." Jackson said he called Cook Tuesday to congratulate him for "stepping up to the plate" to discuss the data. "It shows his personal commitment and his leadership," Jackson said in a statement. "I urge him to take further bold steps to make Apple better, and leverage his leadership to make the whole industry better." Apple has been an outspoken champion for diversity since Cook succeeded the late Steve Jobs as CEO nearly three years ago. The company has trumpeted the phrase, "Inclusion inspires innovation," as a rallying cry. Cook has reinforced that message on his Twitter account during the past two months with periodic posts supporting gay rights in the workplace. As CEO, Cook also promoted Cuban-American Eddy Cue to Apple's executive team and hired a woman, Angela Ahrendts, to oversee its stores. The Cupertino, California-based company also added a second woman, Sue Wagner, to its eight-person board of directors last month. Even with those moves, 72 percent of Apple's leadership is made up of men. Including non-tech jobs, Apple appears to be doing a slightly better job employing blacks and Hispanics than its peers. That may have to do with the thousands of sales jobs at its 427 stores around the world, including 254 U.S. locations. Overall, 11 percent of the employees in Apple's U.S. workforce are Hispanic and 7 percent are black. By comparison, 3 percent of Google's U.S. workers are Hispanic and 2 percent are black. At Facebook, 4 percent of its U.S. workers are Hispanic and 2 percent are black. Technology executives generally have traced the scarcity of women, blacks and Hispanics in computer programming and engineering to flaws in the U.S. education system. Apple, Google and others are financing efforts to steer more women and minorities to math and science in high school. A shortage of qualified women and minority candidates for technology jobs explains some, but not all, of the industry's bias toward white and Asian men, said Marianne Cooper, a sociologist at Stanford University's Clayman Institute and author of a new book called "Cut Adrift: Families in Insecure Times." She thinks most tech companies haven't done enough to attract women and minorities or make the field more welcoming. "The tech boom has been something to behold in terms of being an economic engine, but more people need to be brought along that ride," Cooper said.